Okay, ready? We take off late Thursday. So, why Brazil? Because we’re not going to Bolivia. Now that may require a bit of explanation. I’d gotten the notion that we should go to Bolivia, so that when I told people we were going there I’d get to hear, “You’re going where?” Pretty much nobody goes to Bolivia. So, I found a travel agent and we worked through multiple drafts of itineraries, before arriving at one that looked great. I was about to book the trip when I noticed that virtually everywhere we were going was very high altitude. While I’d survived at heights in Cuzco in Peru, it would be wrong to say I thrived there. So, after a (very short) discussion with Carol, we decide uh-uh. I felt like a complete dolt. My travel agent had not hid the altitude from me. It was there all along, but I just hadn’t focused on it. So, I contacted our agent, told him I felt stupid, but we weren’t going to do Bolivia. He’d been so helpful, though, I told him, we’d like to have him plan a trip someplace else for us (in retrospect, he may well not have regarded this as good news), where would he suggest? Brazil. So, that’s why we’re going to Brazil. The more I explored, though, the more I came to feel that this would be an even better trip for us than Bolivia. We’ve decide to spend time in Salvador de Bahia (an area still heavily influenced by African culture), Rio (because, well, it’s Rio) and a large game area called The Pantanal (on the map below, it’s near Cuiaba, west of Brasilia and near Bolivia). We passed up going to other places we might have, most noticeably, Iguazu Falls, which everyone says is spectacular, because, well, we can’t do everything. Following my normal policy, I’ve stolen information shamelessly from many different websites. I feel justified in doing this, because I’m doing it selflessly, for your benefit, not mine. But will I get the thanks I deserve? Probably not. So, here’s some stuff. 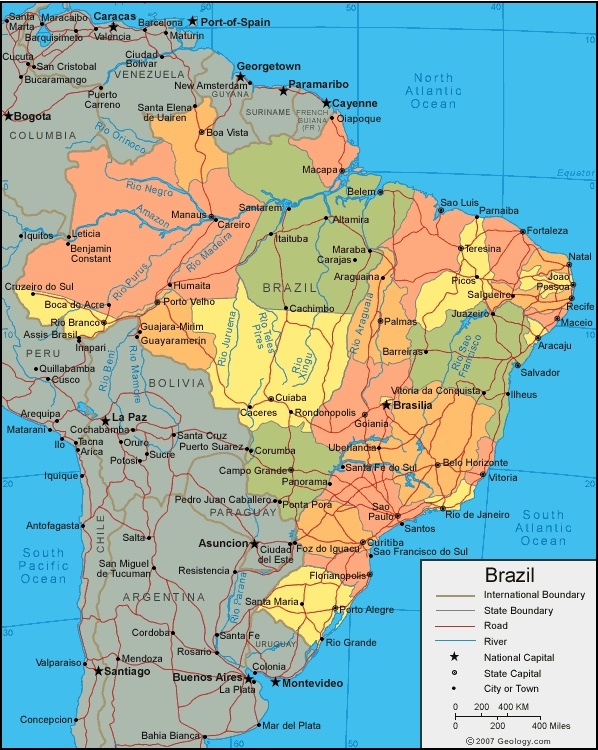 The Federative Republic of Brazil is simultaneously South America’s largest country (by both population and geographical size) as well as one of its most diverse and fascinating. It is filled to the brim with intriguing people, plants and animals as well as liberal doses of history, religion, culture and sporting greatness. (Okay, so this is puffery. Remember, I just plagiarized this, I didn’t write it.) Brazil is a mega-country: fifth in the world in area, sixth in population, tenth in economic production, seventh in steel production, the world’s fourth largest agricultural exporter, and increasingly an industrial power. The most densely populated parts of Brazil are in the south-central regions, which include major urban conglomerates like Sao Paulo and Rio de Janeiro. Because of the rapid growth experienced by this country in terms of urban development, industrialization and population at the beginning of the 21st century, Brazil is facing a number of social, environmental and political challenges. However, it is also because of this growth that it is doing so well in terms of its economy. In fact, it is one of the world’s largest and most significant economies. It is also the only Portuguese-speaking country in both North and South America. This Portuguese heritage dates back to the 1700’s, when Brazil was first colonized by this European nation. During its rich and complex history, slavery was a major part of the Brazilian heritage, although this was never formally recorded in the annals of history. Slaves were brought to the country across the Pacific Ocean from Africa. Therefore, there is also a large proportion of Brazilian inhabitants that have an African heritage. Others of European and Asian descent immigrated to Brazil in the 19th century. These ones were mainly from Japan, Poland, Spain, Italy and Germany. Therefore, this country is now a melting pot of ethnic and cultural diversity. Despite such diversity, Brazil maintains strong national pride and religious devotion. The vast majority, approximately 75%, of the population is Roman Catholic, while the rest are largely Christian or subscribe to the various African-based beliefs. In terms of the local culture, Brazil continues to be influenced by the traditions and customs of the Portuguese. This is evident in the architecture, music, literature, cuisine, dance, religion and theatre of the country. It’s really not possible here to summarize the history of Brazil, which in the twentieth century included a period of some twenty years of military rule which ended in 1985. There followed periods of extreme financial difficulty, including inflation, which in the early 1990s reached an annual rate of 5000%. The last twenty years have involved attempts to get the economy in order and address issues of poverty, health, education, the rural landless and political scandals. The best short history I found is at http://www.lonelyplanet.com/brazil/history. The politics of Brazil take place in a framework of a federal presidential representative democratic republic, whereby the President is both head of state and head of government, and of a multi-party system. The political and administrative organization of Brazil comprises the federal government, the states, the federal district and the municipalities. The states are autonomous sub-national entities with their own constitutions and governments that, together with the other federal units, form the Federative Republic of Brazil. Currently, Brazil is divided politically and administratively into 27 federal units, being 26 states and one federal district. The executive power is exercised by a governor elected to a four-year term. The judiciary is exercised by courts of first and second instance addressing the common justice. Each State has a unicameral legislature with deputies who vote state laws. Brazil enjoys an extensive coastline that measures almost 7500 kilometres (or more than 4600 miles). Its other borders are made up of Venezuela, Guyana, Suriname, French Guiana, Colombia, Bolivia, Peru, Argentina, Paraguay and Uruguay. In fact, Ecuador and Chile are the only South American countries with which Brazil does not share its borders. There are various groups of islands that also belong to Brazil, such as Saint Peter, Trindade and Fernando de Noronha, amongst others. Its entire area measures exactly 8,514,876.599 square kilometres or 3,287,612 square miles. scientists estimate that this South American country is home to about four million different species. Particularly extensive are this country’s populations of birds and amphibians. Finally: a quick, two-part quiz to see whether you’re really old enough to be reading this blog. In the movie “Charley’s Aunt,” what actor famously said, “I’m Charley’s aunt, from Brazil, where the ______ [fill in the blank] come from”? And, by the way, should you decide to go to Bolivia, let me know, because I’ve got a helluva good itinerary (and travel agent) for you. chose this trip location. Want you to know that you and Garrison Keillor are helping to provide rich and full mornings for me. Goodness gracious! Between your blog and The Writer’s Almanac, which arrives daily via email, it’s already 11:00 a.m. In appreciation, I was going to make you a lanyard, but decided on this link instead. Hope you enjoy it. I love reading your blog, Arnie. Great chance to live vicariously. Enjoyed your explanation of your trip to Brazil as opposed to Bolivia. Interesting history lesson. Fill in the blank with nuts. Do I get a prize or a paid trip to Bolivia, Arnie? If so, my bags are packed. Enjoy the journey with Carol! You get half a prize, Margo, for the blank, but, unless you get the other half, the actor said it, half a trip to Bolivia probably doesn’t get you where you want to be. No fair Googling to get the answer. Will be following . . .
I’ve subscribed to your blog! I subscribed to your blog, and I’m looking forward to more posts. Hope your having fun! in too much favor with Wall Street right now but will come back. the movie. Have a great trip. Great start. I may have missed the part about Brazil’s cultural influences. So I’m providing the information I’m aware of. Some say Brazil’s most influential cultural influence is African, as evidenced by its offspring, Afro-Brazilian culture that is said to be dominant though Brazil’s written history and guidebooks don’t reflect this as these material are largely written by persons of Portuguese descent.